Scrubber/dryer detergent disinfects the recovery tank on the cleaning machine. These machines are potentially carrying hazardous microbes and are rarely maintained by the operators. It is also worth noting that the vacuum motor is drawing air from the top of the recovered soiled washed solution and without effective cleaning, it's exhaust is blowing contaminants back into the atmosphere. 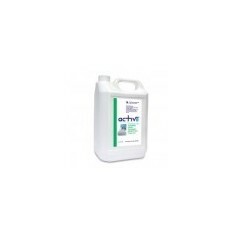 • Unique combination of active agents for superior cleaning.